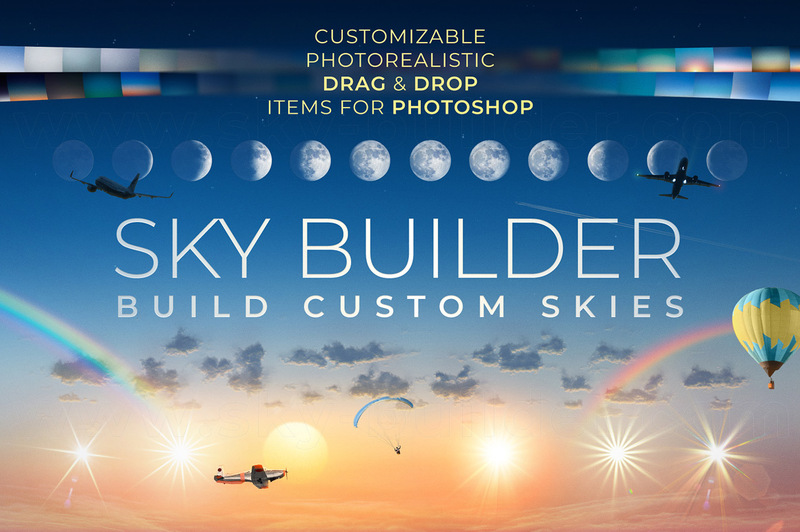 Sky Builder is a collection of customizable drag & drop items for creating photorealistic skies in Photoshop the fast and easy way. 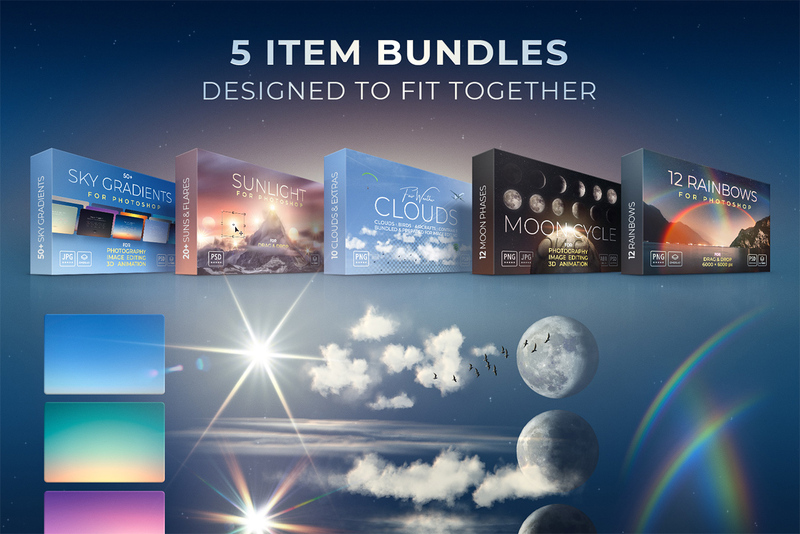 The Sky Builder consists of 5 carefully prepared collections of harmonizing items for creating custom skies in Adobe Photoshop CC & CS6. Perfect for everyone in need of photorealism and full control over every element in the sky. The spectrum of included resources ranges from plain sky gradients over sunlight, clouds, moons, rainbows, rain, star & snow overlays to birds and airplanes. All items were created highly customizable and were prepared for a fast and easy drag & drop workflow. Image editors, photographers, and 3D artists often find themselves in the need to replace a sky in a photo or 3D rendering. Searching for the perfect sky on the internet often takes a lot of time and leads to unwanted compromises. This diverse bundle of resources takes a different approach and enables you to build a unique photorealistic sky for any foreground directly inside Photoshop. The smooth sky gradients are more than simple sky overlays, they support lossless resizing to any resolution and will enable you to set the perfect light direction for your foreground. To get a sky gradient to match your foreground, you can change the gradient’s colors, light direction, brightness, and contrast using prepared layer styles and adjustment settings. Adding a sun, some clouds and maybe even more little details like birds or airplanes will bring your sky to life. Customizable lens vignetting and film grain layers can be activated and will provide the ideal photographic finish. You know what would be awesome…is if you created an add-on that had imaginary planets. This is PURE SORCERY! I can’t get over the editability of these elements. Absolutely astounding work. Amazing. We are so happy with your lovely comment though so thank you for getting in touch! We would love to see anything that you create with your Sky Builder so please do feel free to share anything that you create using your resource! 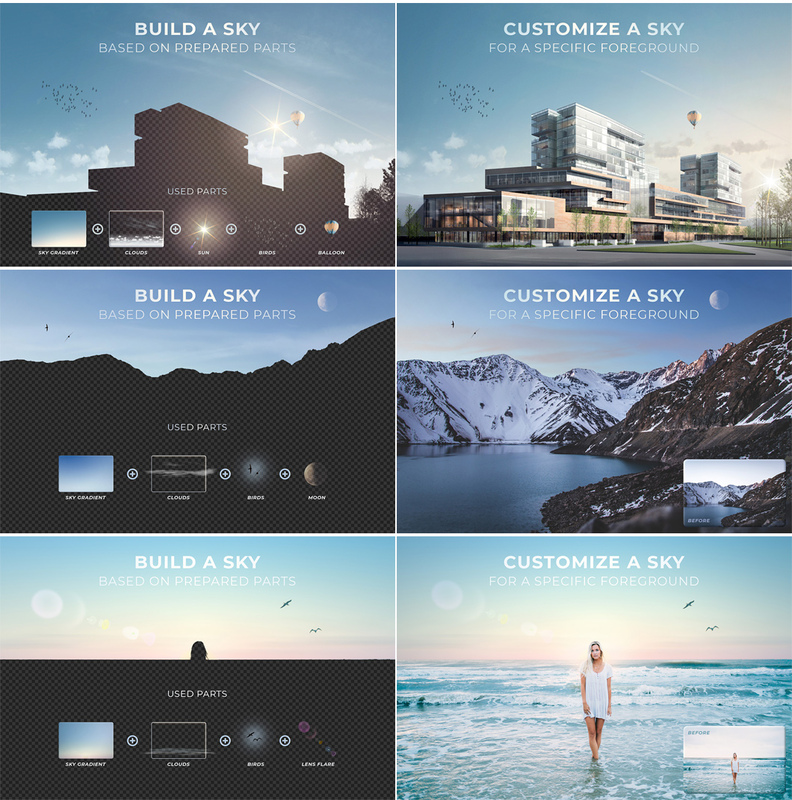 I am interested in Sky Builder but I use CS5. It definately won’t work on CS5? Thanks so much for reaching out and I can definitely help! Unfortunately the designer has advised that you would need PS CS6 or higher in order to work with Sky Builder- I am so sorry to disappoint you about this! Hey Sally, during the process of opening Sky Bilder items in Photoshop CS5, prepared layer styles or effects on layer folders could get lost in some cases – this is why I was unable to add official CS5 support. But you could test a few Sky Builder items in CS5 by downloading the freebie from http://www.free.sky-builder.com and evaluate its usability in CS5 yourself.